A Simple SEO Plan for 2018: Are You Up to the Task? You will hear a lot of buzz about what's important for SEO in 2018. It still comes down to authoritative content and backlinks. Small websites with limited text and hardly any inbound links just can't rank well for competitive phrases. 1. Take stock of your website. 2. Are you using the SEO best practices for page titles, page headers, images and more? 3. What's your link building strategy? Are you getting links by creating original content and appealing to some of your industry contacts for links? 4. How often do you update your content? 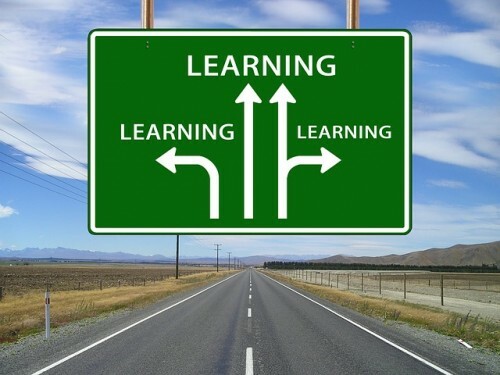 Does it just describe what you do or do you educate your visitors and solve their problems? With Google search engine results pages (SERPs), I think it will get worse over time as if it's not already bad. From up to four ads at the top (they used to be on the right) to lists of "People Also Ask" questions, your #1 organic result really isn't #1 anymore. Think more like #5 or even #7. You need to scroll and scroll to actually see the famous first 10 natural search results. 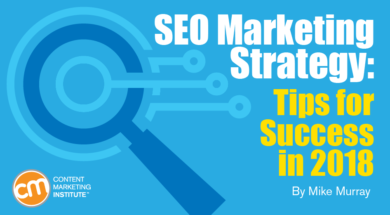 I detail the problem with SEO rankings and include links to some other resources in a new Content Marketing Institute article, SEO Marketing Strategy: Tips for Success in 2018. What's the bottom line? Don't view SEO as a one and done exercise. Analyze data to know when you can modify your SEO efforts and when it's best to create some new content. If you develop content, you might want to check out my updated and expanded guest post at Content Marketing Institute. 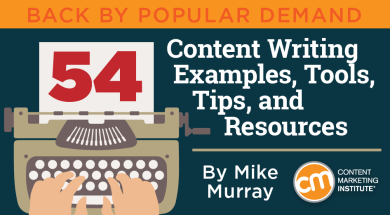 "54 Content Writing Examples, Tools, Tips, and Resources" includes practical advice and a wide assortment of ideas and tools you can use to spark creativity and ensure that you're producing first-rate work. Focus on actionable content that someone can use in their lives or jobs right away. Write in first-person or second-person. Be careful with humor, which can fall flat for the reader. Use profanity rarely because it can throw off someone who may wonder why the content includes those words. Don’t be so creative that a reader struggles to detect your main point. Some marketers are too shortsighted when it comes to their SEO page titles. They make tons of assumptions and mistakes, including what keywords they use (or don't use), where they place the keywords and how many characters they should target. 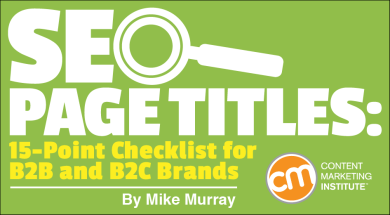 Get the truth about your options with my new Content Marketing Institute article, "SEO Page Titles: 15-Point Checklist for B2B and B2C Brands." For years, online marketers and SEO specialists talked about the 72-character limit. Two years ago, Google updated the design of search engine results pages. So the new "rule" became 55-60 characters. But what does Google say? Absolutely nothing. Does that mean if you write words that fill 75 characters that it's a waste of time? Hardly. 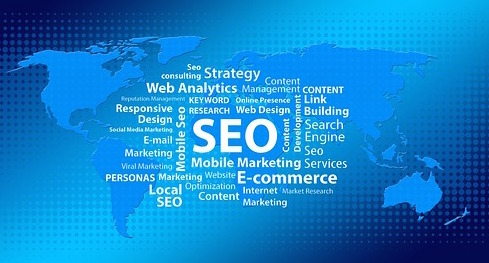 Words in an SEO page title do affect search engine rankings. There is nothing magic about that 55th character. Check out the SEO article. I'm very impressed with an entrepreneur I met last month. She picked the perfect domain, developed a decent website and became an expert in her industry. The information she shares is exceptional. She targets a specific audience. The problem is that it's a reasonable website - not a great one. Fortunately, she's open to a new design and knows that she needs to improve the Information Architecture. In other words, she's willing to recognize what she doesn't know and get help with website development and online marketing. She made some good choices with WordPress and sensible plug-ins. Now she's clarifying what skills she has and how she should make the best use of her time while relying on professionals to tackle what she can't handle.